Internet faxing is an online fax service that eliminates the need for a fax machine, an extra telephone line and all the associated expenses (paper, ink cartridges, etc). 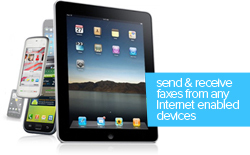 Internet faxing enable you to send & receive faxes by email. Get a real fax number that's tied to your email. Virtual-Office is committed to offer the best value Internet faxing service. Send & Receive faxes with Virtual-Office saves your time and money by eliminating the expenses of a separate fax line, fax machine, fax supplies and other associated costs. By using Virtual-Office internet faxing, you or your business also contributes to the "Greenification" the environment. Virtual-Office is compatible with Email software/services such as Microsoft Outlook, Thunderbird, Eudora, Opera, Microsoft Outlook Express, Web based email clients, gMail, Yahoo Mail, Hotmail and much more. Dedicated Inbound Fax Number [? ]You will be assigned with a Selangor land-line number that starts with +603 5021 xxxx. Faxes received in PDF format [? ]All your faxes are converted to PDF format to ensure no quality loss. FlexiFax Control Panel [? ]Control Panel for you to manage your account online. Never Busy Fax Guarantee [? ]Our no busy signal fax guarantee. Basically your sender will not get a busy signal when they try to fax a document to you. Ultra Clear Fax [? ]High resolution fax whenever you send & receive fax. Convenient.. send & receive anywhere.. anytime..
Virtual-Office Internet fax is very convenient and portable, you can access it anywhere, anytime - wherever you find the Internet. Internet fax services are perfect for mobile professionals and business travelers. Virtual-Office enables you to send a fax from your nominated email account. The email is forwarded to our Virtual-Office servers, where it is converted into a fax and redirected to the recipient's fax machine. Virtual-Office Internet fax is completely scalable to meet any company’s faxing needs, big or small. You can add accounts, remove accounts whenever appropriate. If you have a new sales guy, just sign up for another Virtual-Office account and he will immediately have his own dedicated Fax number to receive faxes as well as the ability to send out faxes. Virtual-Office Internet fax is very easy to do, just attach a DOC, XLS, TXT, TIF, PDF, or JPG file to an email and hit send. It is also a lot cleaner, no messier inks or paper jams. It truly is faxing simplified. Virtual-Office sends your faxes to your nominated email address(es) as a PDF attachment - meaning your faxes are as confidential and secure as an email. Virtual-Office gives greater control over which parties can view faxes. You may choose to save, print, delete or forward faxes to others people. Your privacy and confidentiality is also extended by the fact that faxes are automatically forwarded via email as when they are received, and not stored for any length of time on Virtual-Office servers. All fax numbers assigned by Virtual-Office can simultaneously receive more than 1 fax at a time. Our digital lines supports over 100 channels so it's impossible for your sender to experience a busy signal when sending a fax to you. All faxes sent by Virtual-Office are first converted to digital format thus your recipient can notice that your faxes are clearer than faxes from traditional fax machine.